Why? 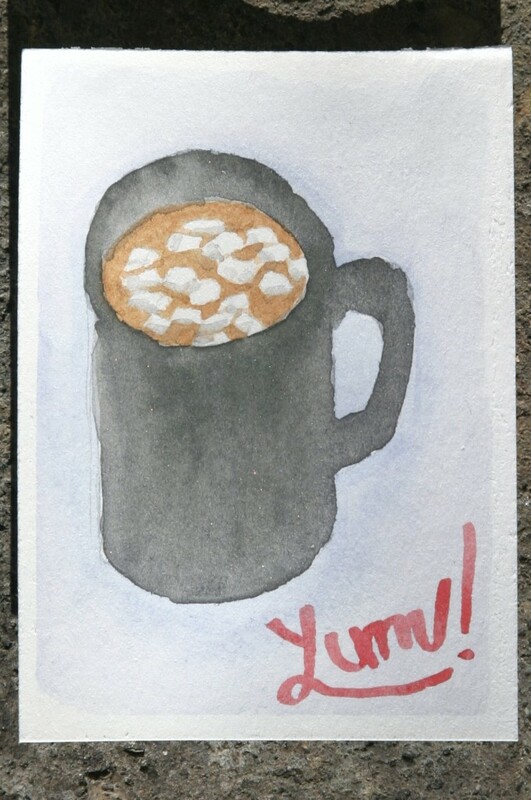 Because it’s chilly here, I’m hungry, and a cup of hot cocoa sounds amazing! Today starts the third week of the new year. 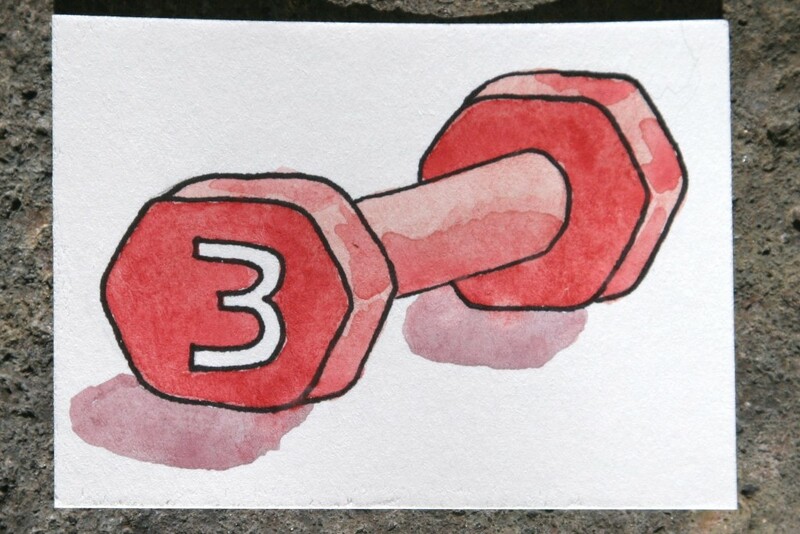 By now, many people have given up on their resolutions. The most frequently made new year’s resolution is to lose weight and by the end of the very first week, 25% of people have given up! By the end of the January, that number jumps to 36% failures! In the end, only 8% of people who make resolutions are successful yet even so, those who make resolutions are 10 times more likely to achieve their goals! Incredible. Check here for even more fascinating data on New Year’s resolutions! Here’s what I’ve come up with for today! 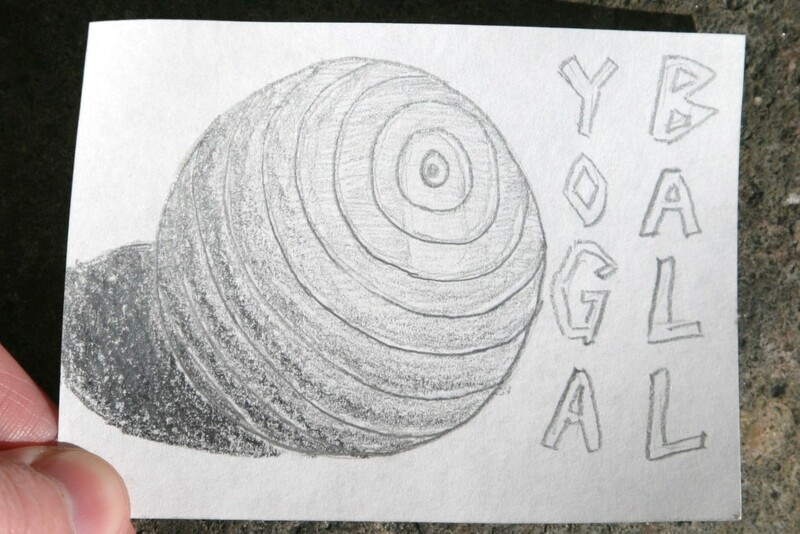 Yoga balls are a great challenge to draw and I’ll probably have another go at one sometime. First you need a good circle, already a challenge, though to be honest I traced a shot glass! Then, you’ve got to get concentric circles which would be tricky enough to draw, but on the yoga ball they’ve got to curl around the ball and add to the illusion of it being a sphere. I really struggled with this one, but the shading sure helped. Still, you know it’s bad when you have to write what it is because you’re not sure anyone would be able to tell. When I was working on the yoga ball sketch, we were having the monthly art day here with my mom and a family friend. The two of them were working on gesture drawings while I worked on some ATCs for the challenge. After lunch they decided to put up an art poster and try to draw from it. Our friend gave me a sheet of his rather interestingly textured pastel/pencil/charcoal sketchpad paper and I joined in. I’m not super pleased with my version, but it’s recognizable at least. I think I’m going to cut this up so I can make some ATCs out of the interesting paper. There’s a few spots large enough to cut a plain white ATC-sized bit of paper. They’re beautiful and it’s January, so why not? Both of mine are watercolor on 140lb paper, however the second, darker one also has a bit of faint 6H pencil. Basically, I decided I didn’t like the first one and did the second one late last night so I’d have something better to share this morning! The faint one was made by doing a blue wash, letting that dry mostly, and then scrubbing out the snowflakes with a damp brush. Additionally, before it was dry, I dripped on some clean water for additional effect. The darker snowflake was first drawn on sketch paper using circle stencils, a protractor to get my wheels into sixths, and then just a good deal of pencil sketching. 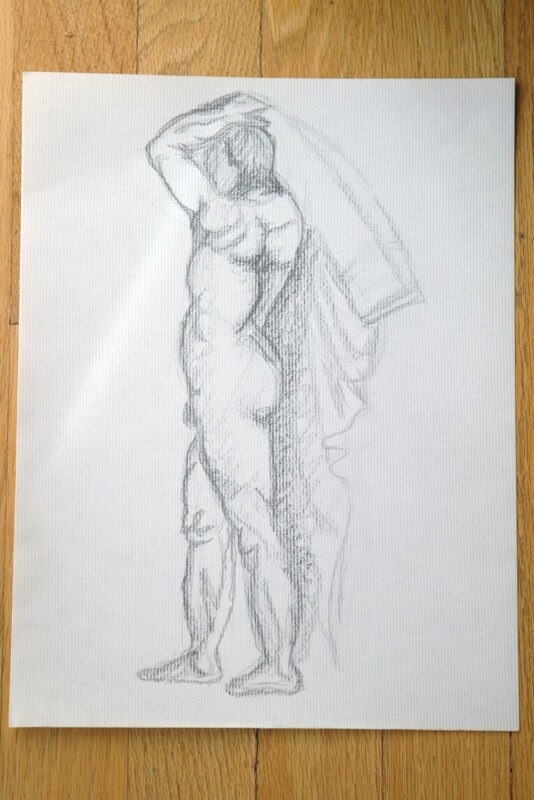 When the sketch was complete, I traced the lines I wanted with a very soft pencil, I think an 8B. 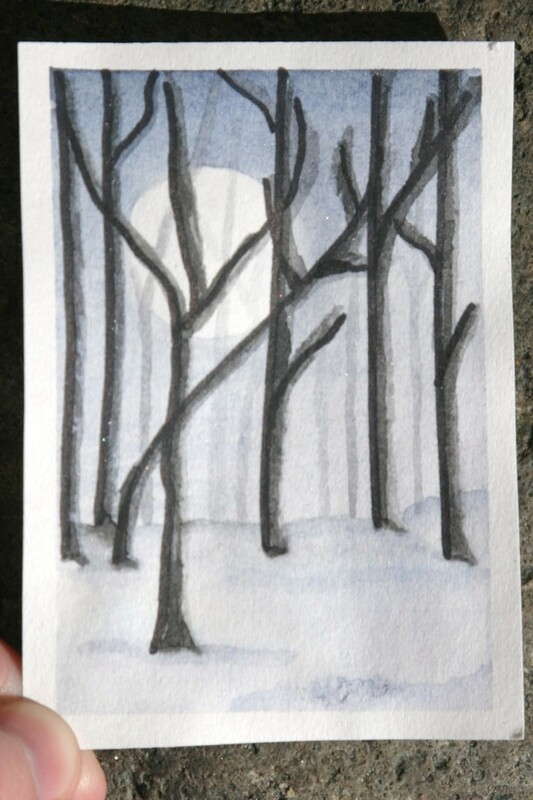 Then I flipped my sketchpad ATC over onto the watercolor paper blank ATC and went at the back of the sketchpad ATC as though it were a scratch ticket. The design transferred beautifully, though reversed of course which doesn’t matter for a snowflake. Since the paper had slid a bit with my scratching vigor, I traced the bold, dark lines with a 6H pencil to get very faint, but slightly depressed into the paper lines for my outline. Then I went over the entire sheet of watercolor paper gently with a polymer eraser. 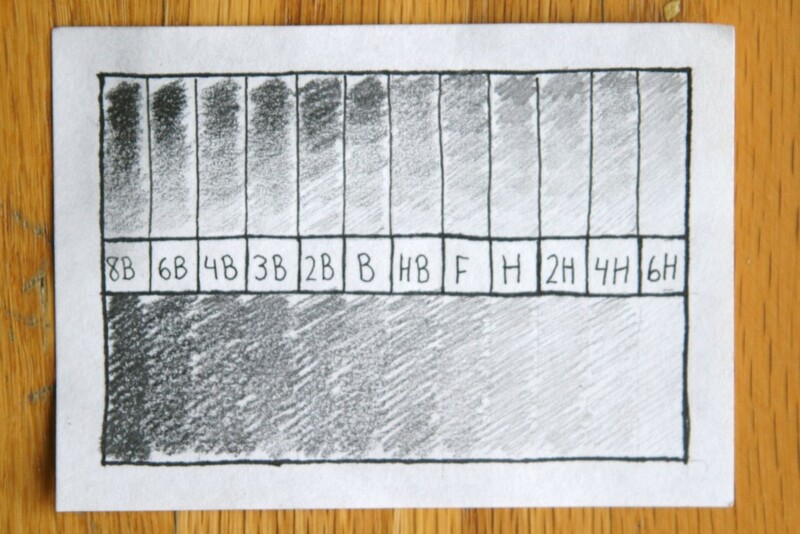 The eraser took off all the bold, dark pencil from the transfer process but left the pale hard pencil lines intact. 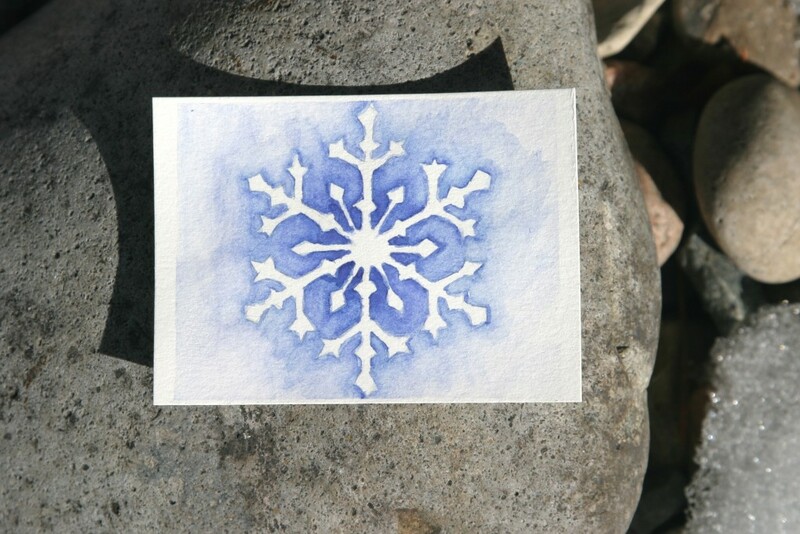 At that point I was able to start outlining my snowflake in watercolor with a very fine nail art brush and use a larger brush with clean water to spread the outline away from the snowflake in a wash. I worked my way around the snowflake four times, each time outlining a little less and spreading the outline a bit less. 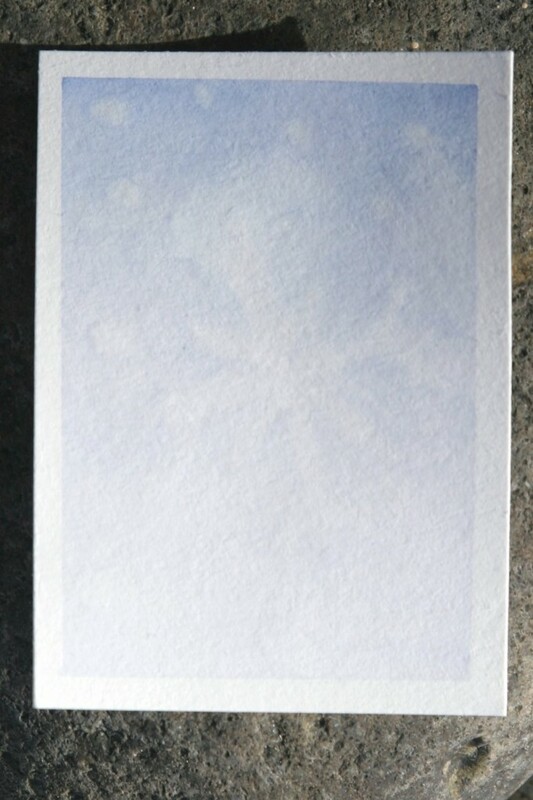 Ultimately, that left me with my white snowflake which has more blue around the center background than the other parts. This would have been a million times more easily completed with Frisket, but since I’m allergic to latex, I try to stay far, far away from that stuff! 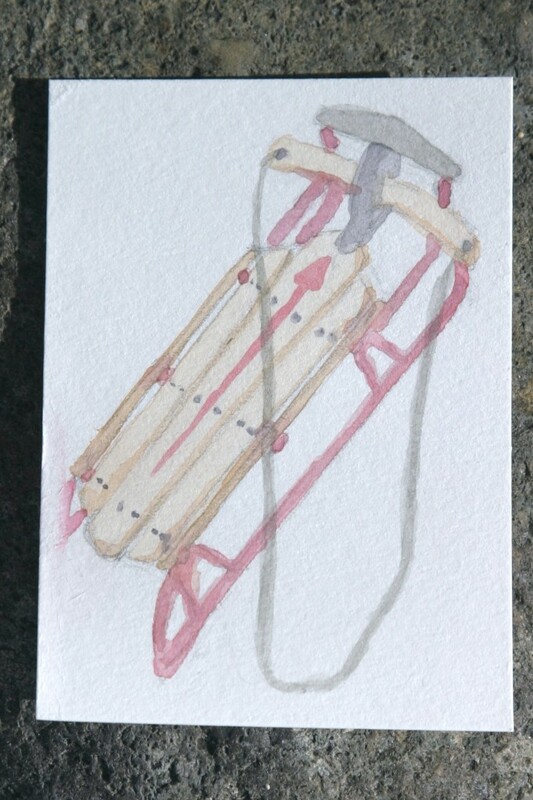 Here’s my painting of my vintage sled! I’m tremendously pleased with this little painting. Today I made a postage stamp in honor of my grandfather who collected postage stamps and passed the hobby on to me. This is the second time in a row where I’ve had issue with how shiny the PRANG colors are when used thickly for more saturated colors. 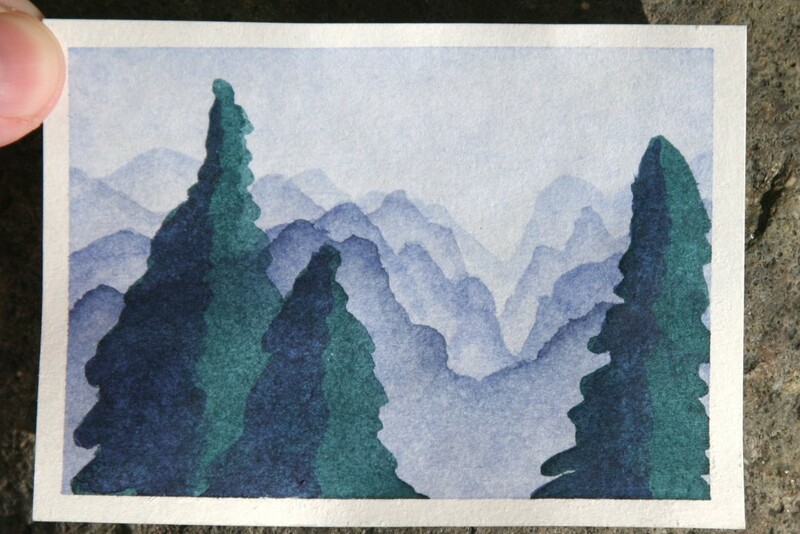 I find it kind of shocking to find fault with the watercolors I’ve trusted for so long, but maybe that too is part of getting to be a better artist, practicing to the point where you surpass the beginner grade materials. Not to say this little ATC is any kind of high art, far from it in fact with it’s crooked text, but the shiny spots really bother me. I think I could do some very cute stamp themed work in a somewhat comical and loose style, but I need the paint to play along with that instead of leaving shiny spots all over the place! In 20074 on tbis day, less than a decade ago, Steve Jobs unveiled the first iPhone. It’s incredible that something we consider so much a part of our daily lives is still so new! I feel like I’ve had my (android) smart phone for ages. 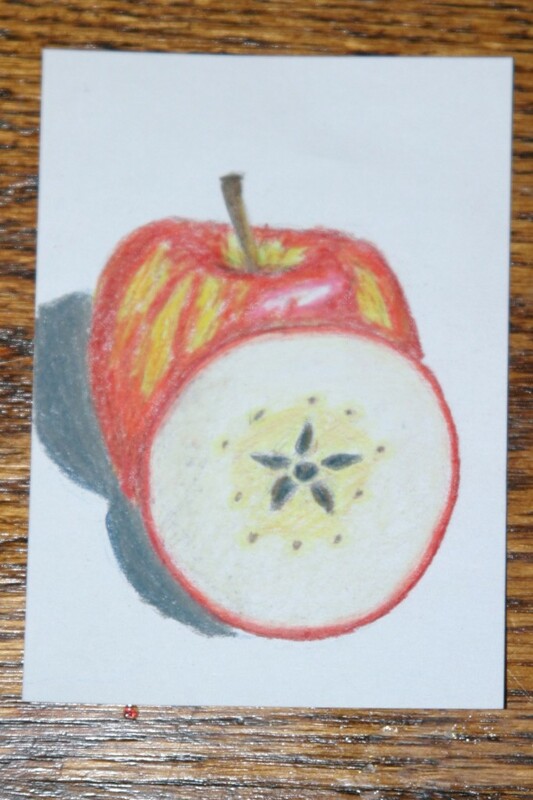 In honor of that first iPhone, today is for creating apples be they drawn, painted, or sketched. Create a still life from an apple you’re having for lunch. Or sketch your phone. Or an Apple logo. 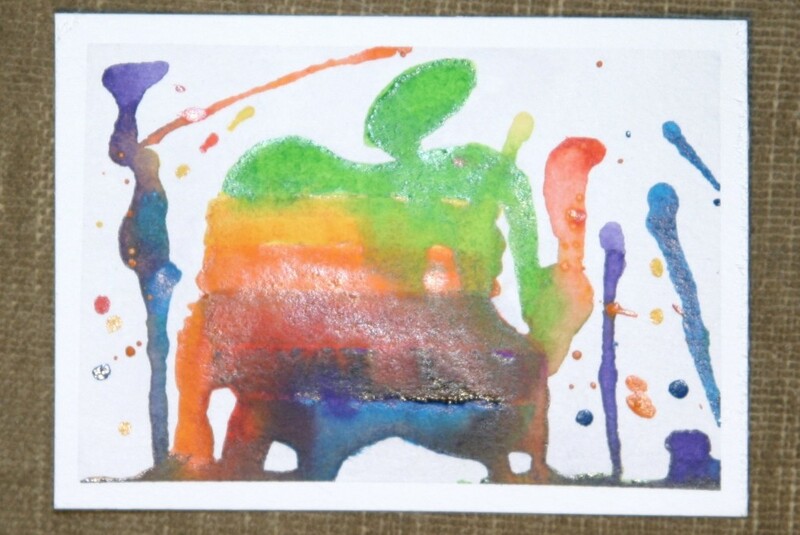 Maybe cut up an apple and use the fruit itself to do some stamping! I haven’t used my Prismacolor pencils in ages and I enjoyed it. However, the paper was frustrating along with how the graphite outlines resisted the colored pencil. I suppose knowing that it resists now I could use that for effect though, so as usual, at least I learned something new! As for the Apple logo? I don’t love it, but I don’t hate it either. Photography was hard again due to the lack of natural light, but it was also complicated by the fact that my ATC is shiny. I put the paint on rather thickly so I could get it to drip, and I think that put on so thickly, it becomes shiny sort of like in the pans of paint in the box. This is the first time my cheap grade watercolors have failed me. In addition to the shiny paint fail, I’m not happy with my drips. I had a hard time getting it to drip at all so I blew on it which ended up making some more horizontal drips which wasn’t quite what I wanted. I love the drippy brightly colored watercolor portraits I’ve seen others do. 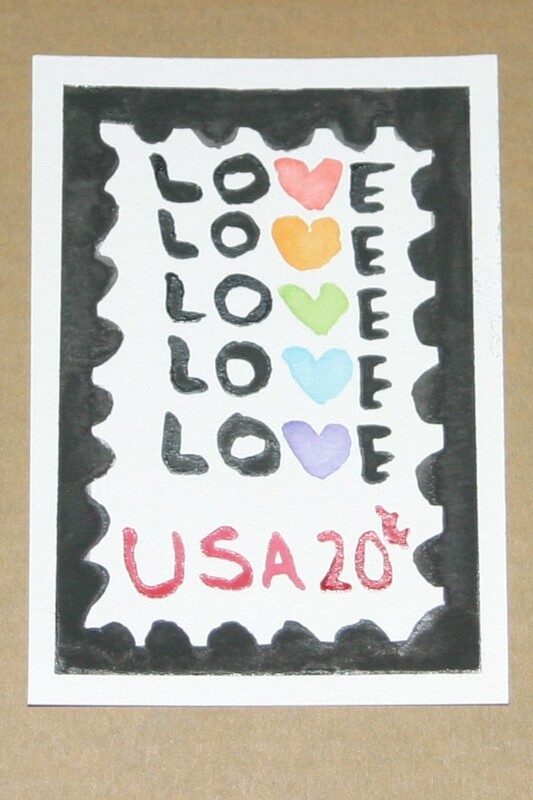 It’s very far outside my style, but I figured I’d like to try it for a few of my ATCs. On this first drippy ATC, I’ve learned I must use higher quality paints if I want to put the paint on so thickly. I think the other solution would be to use more water so I get better dripping and don’t loose too much of the transparency of the paint. 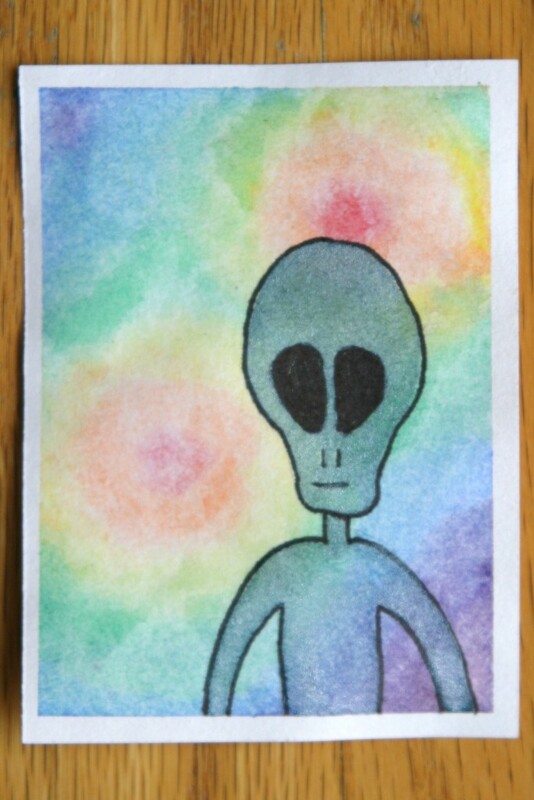 The theme for day 8 of the Daily ATC Challenge is: ALIENS! Some of my early work involved hippie alien murals on my bedroom walls which were inspired by Space Aliens Grill & Bar. As such, I made mine a hippie alien! My background was an extension of the gradients from yesterday. I used a less transparent metallic watercolor also by PRANG for the alien’s skin to help obscure the background. Plus, who doesn’t love a slightly glittery alien? 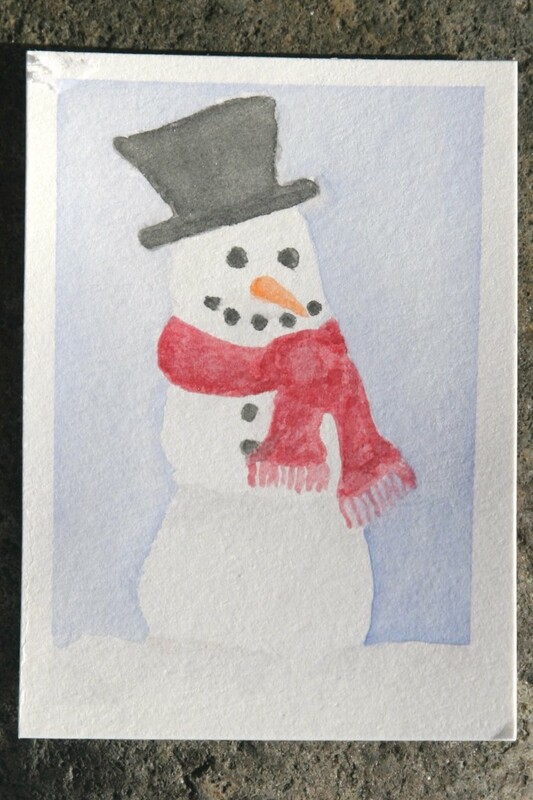 Dayy 7 of the Daily ATC Challenge will be a skill builder day. 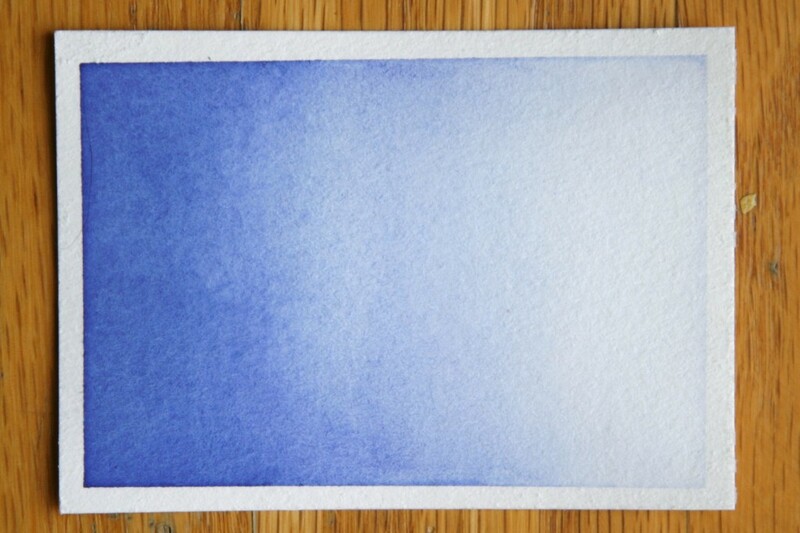 Let’s make GRADIENTS! Any art that makes use of gradients is fair game. Here’s what I did, just some basic skill building bits, but definitely something I’ve learned from! I’ve also found it’s much harder to get nice photos when it’s too snowy to do my photography outside.